If you are day dreaming of warmer weather and already planning your landscaping and home improvement projects, a gazebo might be on your list. While the chill of winter is still in the air, the warm sunny rays of spring are coming closer every day! If you are day dreaming of warmer weather and already planning your landscaping and home improvement projects, a gazebo might be on your list. Here are some of the many types of gazebo designs available to today’s homeowners. Pavilion gazebo designs are octagonal and the image that many people have in their mind when they hear the word gazebo. 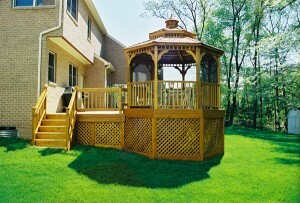 This gazebo design allows you to feel the warm spring breeze on every side. While they are typically octagonal, they can also be purchased in rectangular or ovular shapes if that suits your yard. Victorian gazebo designs fit right in with the traditional Victorian style of housing. They typically have intricate detailing along the beams, knee braces, and wall panels. While they are an obvious fit for a Victorian style home, they are also a fun way to personalize a home that’s a little more cookie-cutter. Pergolas are a slightly different gazebo design, as they don’t have a floor or solid roof. Pergolas are constructed of individual columns that are attached to rafters. Depending on your needs, you can add additional shade to the top of the pergola and partially fill in the space between the rafters. Pergolas are great for getting creative with landscaping, as many homeowners grow vines or flowers up the side for a charming look. Rotundas are circular gazebo designs with domed roofs. They are typically more elaborate and ornate and a beautiful way to accent almost any yard. If you have a gazebo in your local park, there’s a good chance that it’s a rotunda. Ready for the Gazebo of Your Dreams?